Measurements: Frequency, Period, Ratio, Time interval, Power, Rise/Fall Time, Duty factor, Pulse width, Voltage, Freq. range, Burst freq. The CNT-90XL Microwave Counter/Timer/Analyzer offers The Ultimate Tool for measurement, analysis, and calibration of Microwave Frequency and Power. Whether in test systems, on the R&D bench, in the calibration lab, or out in the field, the CNT-90XL is the state-of-the-art in microwave counters, outperforming any existing microwave counter on the market. The CNT-90XL is the fastest microwave counter in the world: with integrated power meter, a unique ease-of-use, graphic display, and improved control over measurement–all at an outstanding price. The new CNT-90XL Microwave Counter/ Analyzers set new milestones for microwave frequency counting and outperform any microwave counter on the market with higher resolution, speed, and acquisition time. 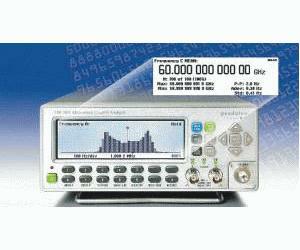 The measurement speed is up to 250,000 frequency samples/sec. This speed allows for advanced statistical analysis. There are four models of the CNT-90XL that measure to 27, 40, 46, and 60 GHz all with power and burst capabilities, standard. You can capture ultrafast FM, analyze radar chirps, measure VCO post tuning drift, analyze short-term frequency stability, and more. High resolution provides mHz resolution on GHz signals. USB and GPIB interfaces come standard. The graphic display shows frequency changes over time directly on-screen, e.g. fast power switching or FM. Built-in statistical processing presents numerical stability data as well as frequency distribution histograms for on-screen analysis of frequency/power stability or modulation.